In my own lifetime I have seen the technology of the internet advance in leaps and bounds. I remember the dial-up sound. I remember the first mp3 that I downloaded, thinking that a 2-3 megabyte file was large and wondering why I would even want a song on my computer. I remember when streaming videos were only watchable for those with particularly powerful internet connections. If possible, downloading (and waiting hours!) was the better option. How far we have come! Today, there is a proliferation of good (not to mention terrible…) content at one’s fingertips and even in one’s pocket. 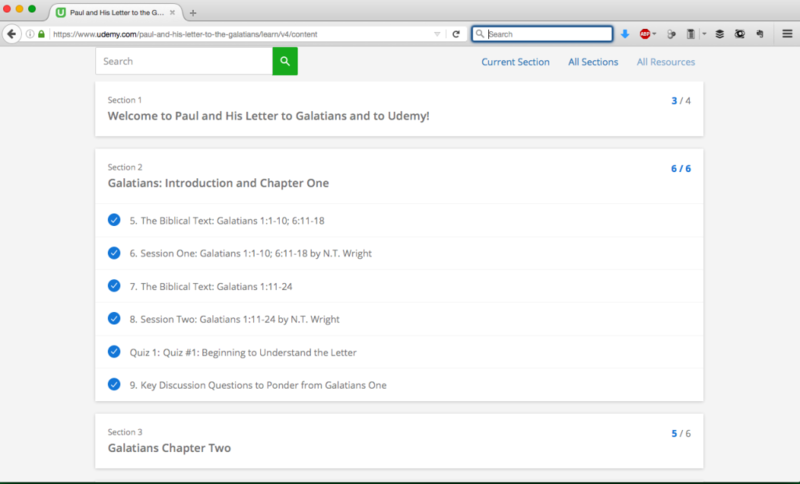 When it comes to Biblical resources, we are in an exciting time. Third Millennium and Biblical Training offer free seminary-level courses. 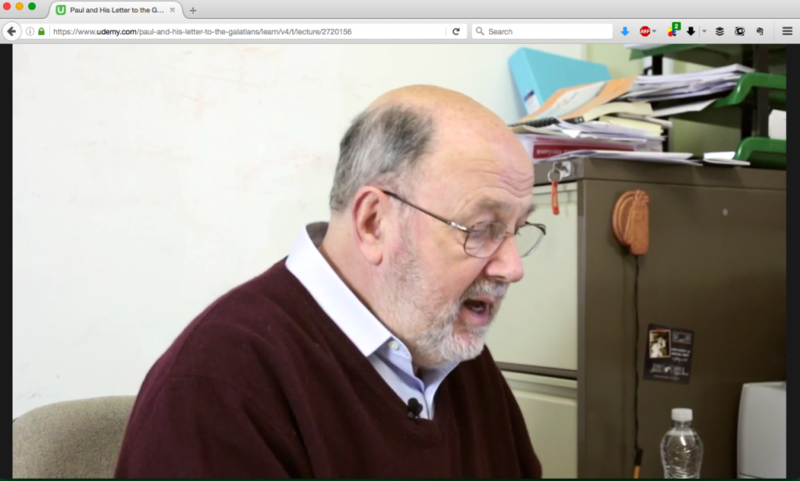 Many seminaries offer free content, even entire courses. Logos Mobile Ed picked up this idea and professionally polished it (see my review), and now N.T. Wright Online has appeared on the scene (hereafter NTWO). What does it offer? How is it different? N.T. 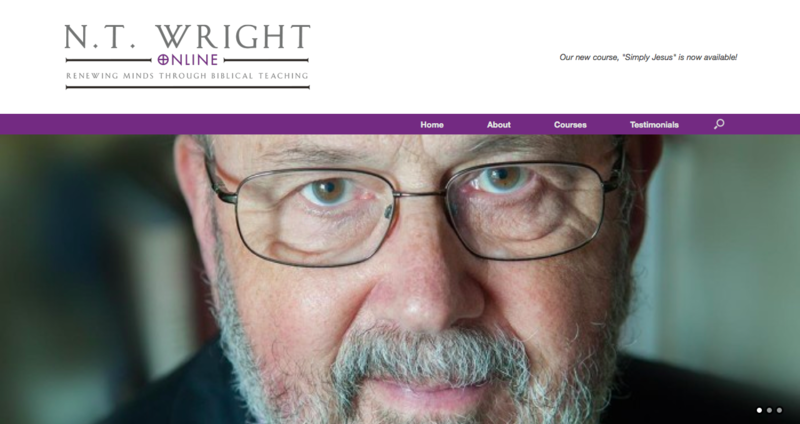 Wright Online, as one may expect, is entirely devoted to courses taught by N.T Wright. These courses are hosted on Udemy. They are filmed specifically for the site and courses vary in content from summaries of Wright’s books (Simply Good News) to Biblical books (Galatians and Philippians). 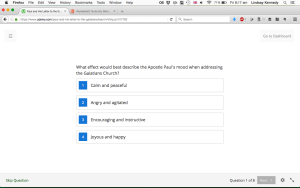 In this post I have the pleasure to review the first course, Galatians. 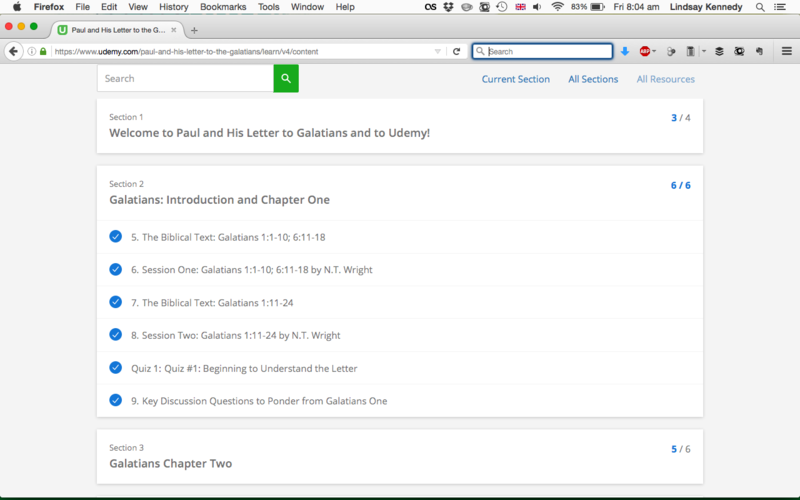 The Galatians course consists of a total of 4.5 hours of video content split over 36 lectures, embedded PDFs of the Biblical text in N.T. 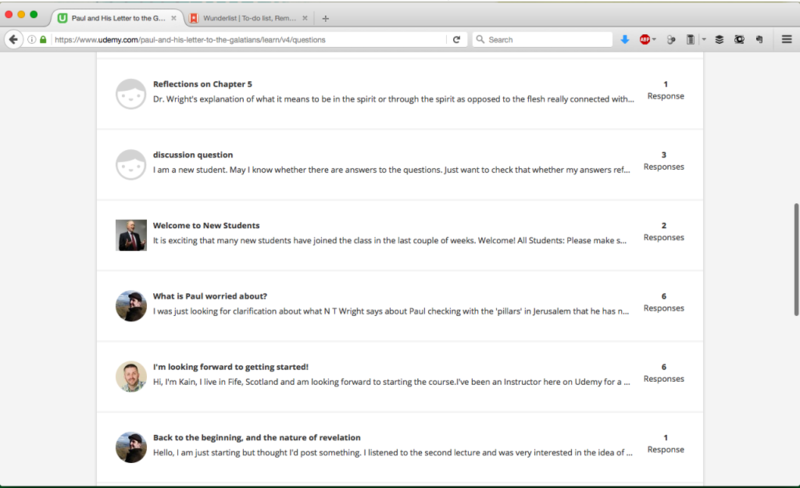 Wright’s own translation, quizzes on the content, and discussion questions. The video is streamed (but can be downloaded on iOS devices). Quality is crisp and can be switched between either 360p or 720p. Playback speed can be adjusted (0.5x – 2x). Bookmarks can be added at chosen points of the video. The whole interface runs smoothly. Wright is recorded by two cameras; one angled at him and one from the side. It appears to be recorded at Wright’s own desk, which adds to the personal feel. However, speaking personally, I found this distracting as his workspace had loose papers that drew my eye. This is particularly seen from the side shots (see below). At times Wright also looked down and scanned through his notes. He does it rarely and is to be expected from a lecture, but having the notes behind the camera would have kept Wright’s eyes on the camera and improved the experience. At times, hand gestures are partially or completely off screen (see above). I am not sure how this compares to future courses and others will no doubt find these observations trivial. 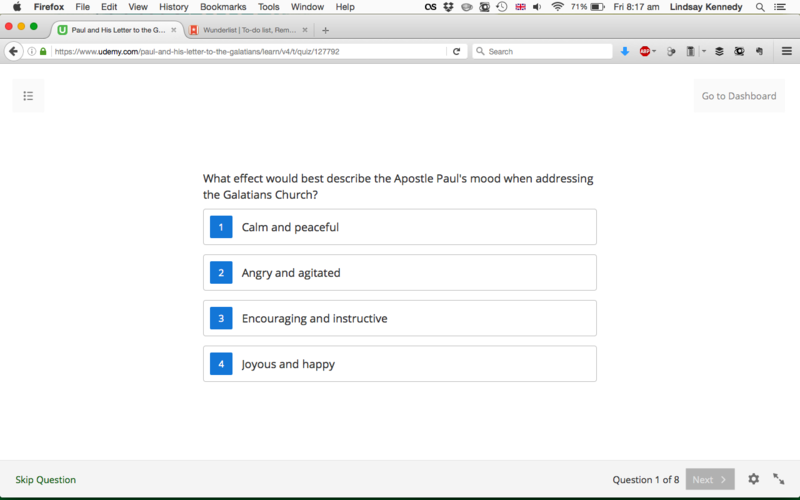 The quizzes are simple and contain a handful of multiple-choice questions to encourage the viewer they are on track. This is an area where NTWO sets itself apart from the other options: community is an integral part of the experience. Students ask questions and interact with one another and the course supervisor David Seemuth. It appears that Seemuth addresses each and every question. 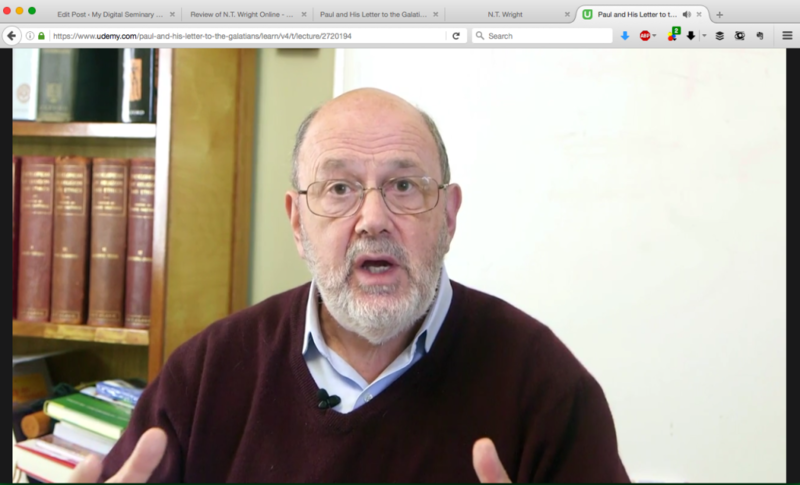 I viewed the entire course between my iPhone and iPad, using the Udemy app. 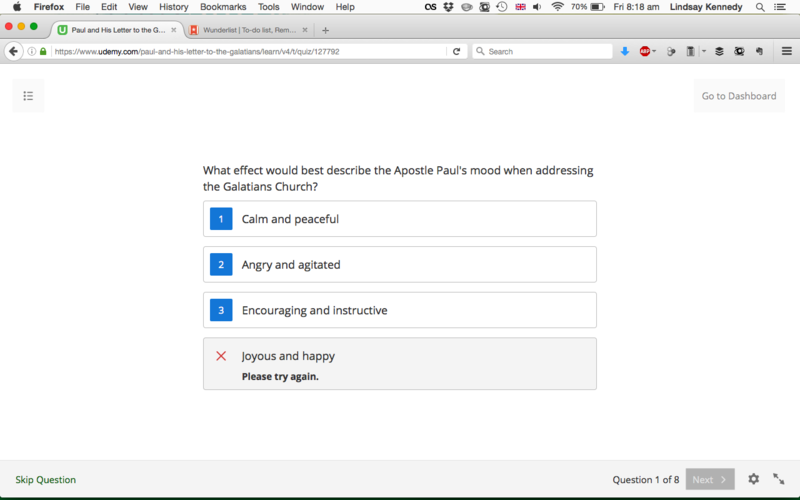 The experience was seamless and enjoyable and every element (video, interaction, quizzes, etc) worked flawlessly. Videos could be pre-downloaded to the device for seamless and/or offline viewing. I have saved this for last, though for many it will be the key factor. The reality is that if one has heard Wright speak, they will know he is a top-notch communicator. His friendly and clear way of speaking is always interesting, even (especially?) when being slightly controversial. Complex ideas are made simple, and the big picture is ever in view. 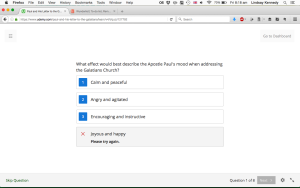 I leapt at the chance to review Galatians since Wright holds to the New Perspective on Paul and I wondered exactly how he would handle key sections, especially in a teaching format. In fact, I found little of import with which to disagree. Indeed, the course was impacting and filled with Wright’s usual unique applications. The content was phenomenal. N.T. Wright Online shares most similarities with Logos Mobile Education, as both are comprehensive, top-notch, and paid experiences. They differ in some key areas, however. First, Mobile Ed has a multitude of courses and speakers, where as NTWO is entirely Wright talking about his (admittedly, broad) areas of expertise. Second, while Mobile Ed has a community aspect, NTWO’s is far easier to navigate and I found it more fruitful. 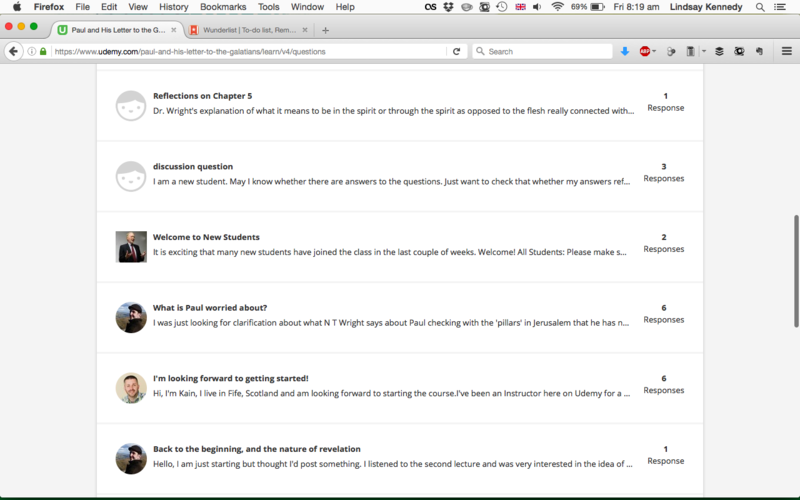 Third, while Mobile Ed required and suggested reading may include a few or several (expensive) books that the viewer does not own, NTWO’s Galatians course only required Wright’s inexpensive Paul for Everyone Galatians commentary. 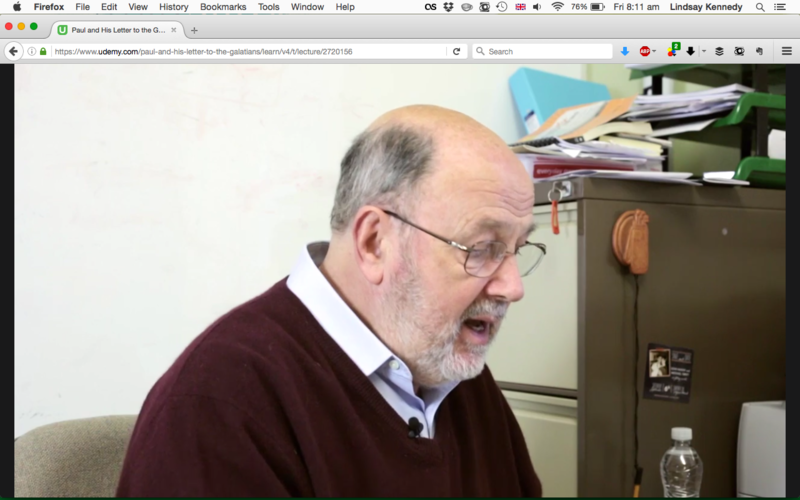 Fourth, Mobile Ed splits its videos into bite-sized 3-8 minute chunks, often devoted to one topic or idea (even when the course is a Bible book). This is all are particularly great for teaching environments. NTWO, however is much more tailored for the individual, and videos range 15-25 minutes. Both Mobile Ed and NTWO are equally excellent and play different roles by meeting different desires and needs. I can recommend without reservation N.T. 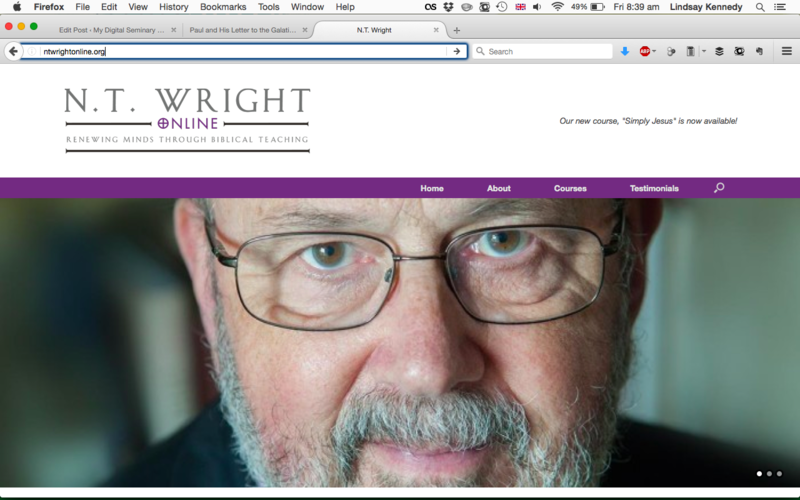 Wright Online for any interested potential students. Many thanks to David Seemuth for providing access to this course in exchange for a fair and honest review.